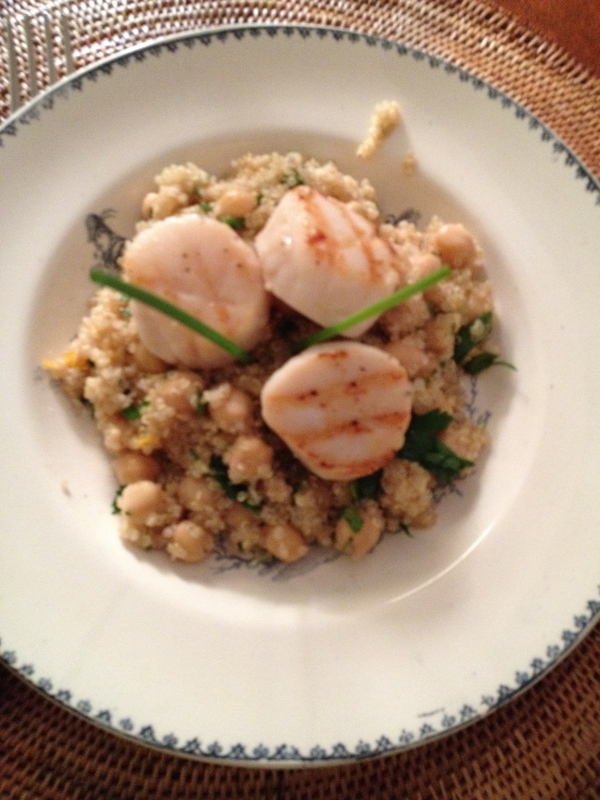 Grilled Scallops on a bed of Orange Flavored Quinoa and Garbanzo Beans: A perfectly light, protein-packed dinner. This meal is an easy dish to make for friends and family and is even easier to make for one. Recipe: In a small saucepan, combine the quinoa with 2 cups water, the orange zest, and the orange juice. Bring to a boil, reduce to a simmer, and cover with a lid. Simmer for 15-20 minutes, or until the quinoa has absorbed most or all of the liquid. Meanwhile, heat a grill pan and drizzle with olive oil. If the garbanzo beans are not already warm, throw them onto one side of the grill pan to heat them up, or alternatively heat them up in a small saute pan. Add the scallops to the grill pan and season with salt and pepper. Grill about 3 minutes on each side, or until they are opaque and have nice grill marks. Toss the parsley and the garbanzo beans with the quinoa. Spoon the quinoa into bowls and place the scallops on top. Garnish with the chives. Add more orange juice, salt, pepper, or maybe even a little lemon juice to taste. Made this for company this weekend delish!